Miniaturization of medical devices is not a new phenomenon, certainly, but the dimensions continue to shrink as the walls become thinner and geometries gain in complexity. That’s good news for patients, who will take comfort in these small improvements, but it can be challenging for moldmakers and injection molders. They are tasked with manufacturing parts and assemblies with length-to-thickness and length-to-diameter ratios that go beyond what was thought to be theoretically possible not so long ago. Isometric Micro Molding Inc. (New Richmond, WI) has established an enviable reputation in medical micromolding during its almost 30-year history; Vice President Donna Bibber took some time recently to discuss the medical trends that are driving demand for thin-walled parts that can’t be seen with the naked eye and the manufacturing technologies that are enabling these tiny triumphs of medical engineering. Three higher-volume markets are creating a growing demand for micromolded parts, according to Bibber: Intra-ocular procedures, minimally invasive surgery and diabetes monitoring and treatment. Donna Bibber, Vice President, Isometric Micro Molding Inc.
Minimally invasive surgery requires precision devices that travel through or on the end of a guidewire. Again, micromolding provides the necessary precision on such a small scale. The third growth sector, unfortunately, adds Bibber, is diabetes management. “Glucose monitoring devices and pumping mechanisms, needles and needle-less cannulae are in high demand and they also need to have thin walls for patient comfort,” says Bibber. Moreover, you typically need thinner walls as pumps and their constituent parts get smaller and parts are consolidated into assemblies that need to fit into smaller spaces, she adds. To successfully and safely achieve those requirements, tooling design and validation are key, says Bibber. The biggest risk to a micromolded part is in tooling design, she says, “because what you have in steel is what you get in plastic. Even though you have to apply the shrink, it’s minimal just given the size of these tiny parts. Building tooling to less than 20% of tolerance, regardless of the tolerance, can be really challenging, says Bibber. “Because the parts and molds are so small, the tolerances get smaller and the tooling still must be made to 20% of part tolerance for a good processing window. For example, with tolerances of ±0.0005 inches, the steel tolerances must be ±0.0001 inches,” explains Bibber. Donna Bibber will present a paper on ultra-thin-walled micromolding at the co-located PLASTEC West and Medical Design & Manufacturing (MD&M) West event in Anaheim, CA, on Feb. 5 at 9:15 AM. She will discuss the design and development of thin-wall parts and the material selection process as well as present case studies. Bibber will also participate in a panel discussion—How miniaturization is driving design in top medical device categories—on Feb. 6 at 11 AM. For more information and to register to attend the event, which runs from Feb. 5 to 7, 2019, at the Anaheim Convention Center, go to the PLASTEC West website. Isometric Micro Molding has invested in CT scanning equipment to “make sure our assembly has stack-up tolerance concerns. We can see inside an assembled device without having to cut the assembly with a razor blade to see what’s going on.” The CT scanner is especially helpful when you’re troubleshooting, says Bibber. For example, you can quickly see if there’s more bond on one of the sides. That speaks to the speed-to-market factor. 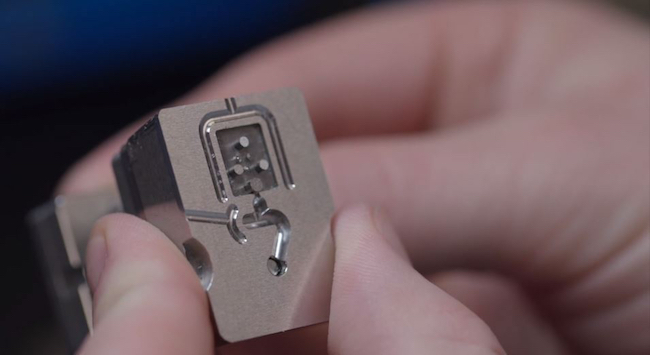 “Micromolding has not been hailed as a fast process—you have to take your time and make sure you have everything right. Using a CT scanner helps to accelerate that process,” says Bibber. It’s especially helpful to have that equipment in house rather than sending out parts to be scanned, she adds, because that eliminates having to try and guess how your service provider established datums and programmed the system to inspect the part or assembly. Isometric Micro Molding began as a moldmaker in 1990, and one of its core values has always been transparency, says Bibber. Maybe it’s become something of a buzzword, she notes, but her company holds firm to that founding principle. If the customer is in the dark on the mold build and micromolding end, there’s a gap in the OEM’s design history file. How do you mitigate risk if you can’t see the whole picture? asks Bibber. That clarity can be achieved through transparency.